From cancer researcher to preschool teacher and beyond, HHS prepares students for dynamic careers in the ever-expanding fields of health and human sciences. You’ll be amazed by the wide-range of career options HHS majors can offer. Just click on the links below and see for yourself! Today’s competitive workplace demands more than just classroom learning. HHS offers students experiences beyond the classroom, such as undergraduate research, study abroad, real world healthcare training (clinicals) and internships. 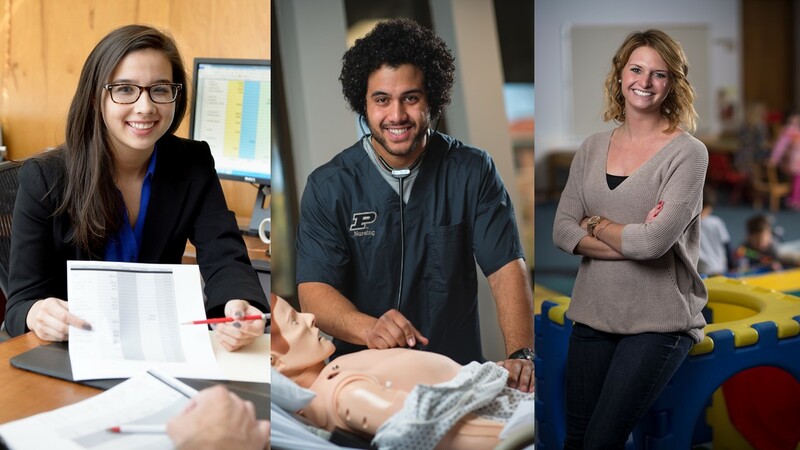 Academic advising is essential to student success at Purdue University. The central goal for the academic advising relationship is to assist students in the purposeful creation of an educational plan that includes curricular, co-curricular and extracurricular goals, objectives, and activities. Click the appropriate link below for a listing of advisors for that department. For information about academic advising and what you can expect, click here. The HHS student services staff members are located in offices in the Civil Engineering Building, Johnson Hall of Nursing, Marriott Hall, Matthews Hall and Stone Hall. Our central office location is in Matthews Hall, Room 117. Please feel free to stop by and schedule an appointment, request information and a tour or just ask a question.